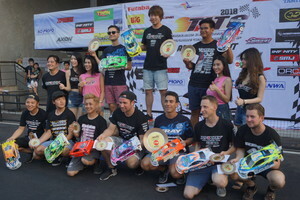 On March 2nd - 4th, 2018, TITC was held at Infinity Addict Circuit in Bangkok, Thailand. We upload Drivers' PGS-LH Setting Data. We upload modify class champion "Akio Sofue" and Team X-RAX Alexander Hagberg. Then, we upload stock class A-main driver Tsuboi. Please check their great setting and refer when you try PGS-LH setting. Thank you for you are always using SANWA product! !